The event organised by BBMRI-ERIC and SPIDIA4P at the European Parliament gave the opportunity to all actors working in the field of personalised medicine, in vitro diagnostics and standardisation to discuss the main regulatory challenges during the discovery and development of new biomarkers for in vitro diagnostic medical devices (IVDs) and personalised medicine solutions. Can new international and European standards increase patients’ safety by reducing the negative impact of external factors on in vitro diagnostic test results, thus ensuring that patients obtain diagnoses that are as objective as possible? Can these standards help to decrease uncertainty for industry players during the discovery, research, development and clearance process of new IVDs? These were the main questions that a panel of high-level experts — academics, industry professionals, healthcare professionals, national decision makers and regulators from all over Europe — discussed at the European Parliament during the event “Tackling issues of in vitro diagnostics for personalised medicine, SPIDIA4P”. This event was hosted by MEP Meissner (ALDE, DE) and MEP Wierinck (ALDE, BE) and organised by the EU-funded project SPIDIA4P, working on standardisation and improvement of pre-analytical tools and procedures for in vitro diagnostics, and BBMRI-ERIC, the research infrastructure connecting more than 500 biobanks across Europe. The future of healthcare is personalised medicine, which means developing tailor-made solutions to the specific needs of individual patients and well-defined patients’ cohorts. Standards play an important role in the research, development and implementation of personalised medicine solutions. They are part of the knowledge economy facilitating innovation and the adoption of new technologies. They are key elements of the competitiveness of European industry. They can improve safety and performance of products and services. Patients benefit from the standardisation of in vitro diagnostic practice. By end of 2020, SPIDIA4P plans to have developed and implemented 22 new International ISO and European CEN standards for improving the quality of patients’ samples and their processing before the final analytical test is run (pre-analytical workflows). Some of these have already been released. “The standardisation and improvement of pre-analytical workflows is a decisive prerequisite for reducing the numbers of diagnostic errors in healthcare and of non-reproducible research and clinical studies with human specimen. The released and the upcoming CEN Technical Specifications and ISO International Standards for pre-analytical workflows play a central role in achieving these goals,” said Dr. Uwe Oelmueller, QIAGEN GmbH and SPIDIA4P Coordinator. These were energetically tackled and discussed by our speakers and attendees. The debate highlighted how the SPIDIA4P project and BBMRI-ERIC can provide solutions to researchers and industry to develop safer and more effective IVDs and how to improve laboratory diagnostics. The BBMRI-ERIC Directory has 100 million samples: is it a problem if so far samples could not be collected according to new standards and are thus not of the same quality? How does the collaboration between biobanks and industry work? How does the sharing of data and samples happen? Some companies have their own biobanks: is the information available to other researchers? Why aren’t networks of biobanks organised in a more coherent way in European countries? Why do we have national frameworks that are so different from one another? This last question is familiar within BBMRI-ERIC, SPIDIA4P and the biobanking community. Our organisations know the legal, financial and practical obstacles to the development of sustainable, reliable and efficient biobanks. “We know that some countries regulate biobanks via ad hoc legislations, while some don’t. We know that some countries provide sufficient funding to biobanks, and some don’t. Standardisation, unification is one of the raison d’etre of the European Institution,” said Erik Steinfelder, Director of BBMRI-ERIC. 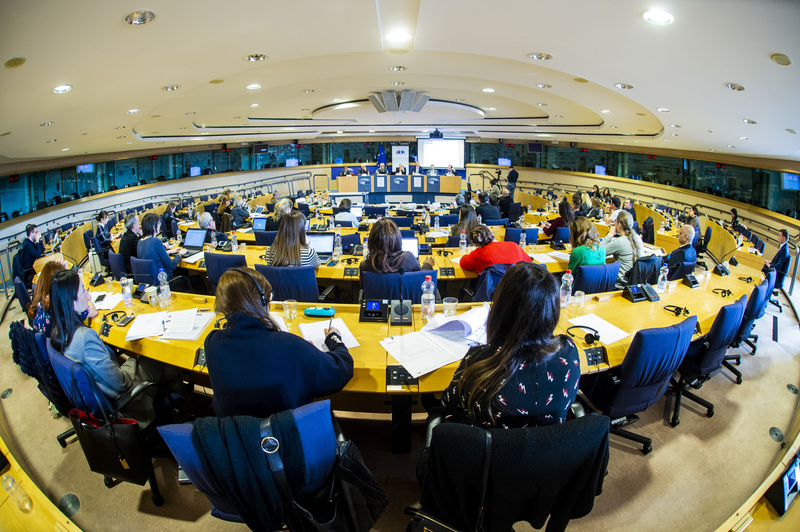 European policymakers showed the biobanking community that the European Parliament can understand the complex technical difficulties related to biobanking, and that they are ready to listen. The support showed by MEPs Meissner and Wierinck is the first step towards the development of a discourse over the role of biobanking, standards and industry-academia partnerships in the development of new personalised medicine solutions, to which the European Parliament should be partner and protagonist. The SPIDIA4P project receives funding from the European Union’s Horizon 2020 research and innovation programme under grant agreement no. 733112. The room was filled with standards experts, scientists, industry representatives, and national regulators. MEPs Meissner and Wierinck set the tone, reminding everyone that industry and regulators have a responsibility to bring the safest and best diagnostics to the market as soon as possible.